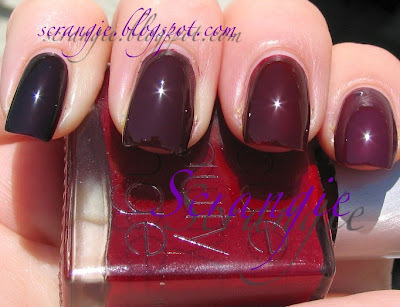 Scrangie: Rescue Beauty Lounge polish comparison. Since the Rescue Beauty Lounge swatches I posted earlier seem so similar, I took a quick comparison picture to show the slight differences between the colors. They are all dark, deep, vampy colors but they have distinctly different tones. Pinkie to index: Film Noir, Moulin Rouge, Atame, Drifter. Bottle is Killa Red. This is taken in very bright direct sunlight, so it's a little washed out, but that really helps to show the differences. Same order as before, but with ridiculously exaggerated flash. You can see how different the base colors are. Again, I can't rave enough about how awesome the formula is on these. I just hope that one day they expand their color selection. I'd love to see a deep purple shimmer, or possibly a darker green shimmer, a deep green or purple creme, or even a metallic, like gold or silver. You're killing me with these RBL swatches... I love RBL but I had to swear them off for a while cause of money constraints. Waaaaaah. Wow! They all look absolutely stunning! I wouldn't mind having them in my collection! Still RBL Recycle is the most expensive nailpolish I own so far. It even got more expensive than the Ebay-bought OPI Rainforest. Still, I think Recycle was well worth the money so you neer know. Maybe these will be mine someday!